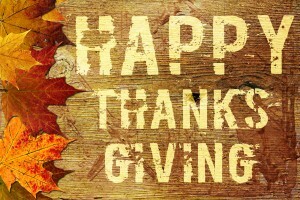 We’d like to wish everyone a happy and safe Thanksgiving this Thursday. Thanksgiving is a wonderful holiday that encourages families and friends to come together to enjoy one another’s company. For many it’s one of the few times a year they get to see their family, so it’s a very important holiday since it brings people together. Each year the majority of the country travels, even if only for a short distance, during the holiday making the day before Thanksgiving, Thanksgiving & Black Friday some of the most trafficked days of the year. The increased traffic, likelihood of inclement weather and higher number of intoxicated drivers makes them of the risker travel days of the year. According to a recent USA Today article from 2006 to 2011 15% of vehicle-related fatalities took place during the Thanksgiving holiday. While that information should not discourage you from driving during the holiday it’s important to be alert and aware of your surroundings while on the road. Between people driving faster than is safe to get to their destination and potentially icy roads it’s important that drivers drive safe and intelligently. Here are some Thanksgiving driving tips to keep you and your family safe this holiday. Check the weather before heading out. If it’s less than ideal conditions consider leaving much earlier than you planned on and be prepared to stay overnight if the roads become unsafe throughout the day. If a winter storm hits and you have to drive during it make sure to have a winter emergency kit in your car follow our winter driving tips. Make sure everyone riding in your car is properly buckled up before hitting the road. The easiest way to prevent major injuries and deaths is to use wear properly fitted seatbelts and if needed child seats. Resist the urge to speed and/or drive recklessly to get to your destination quicker. It’s better to arrive five minutes late than not at all. No matter how tempting it is to call or text to let your family know how close you are have someone else in the car do it. Distracted driving is a huge problem and on Thanksgiving when there are many more cars on the road you can’t afford to be distracted. It’s also illegal in many states and you could receive a costly ticket if pulled over for it. During many holidays alcohol can play a factor in the amount of accidents and Thanksgiving is one of those holidays. Many people have a drink or two with dinner or while watching the game. If you are the driver either abstain from drinking or wait long enough to drive that all alcohol is all out of your system. If you are taking a lot of stuff with you for the holiday pack your car so none of the items obstruct your vision. It may take a few more minutes to pack everything into the car, but it’s safer when driving. Following these Thanksgiving driving tips will help make your drive smoother and safer something that all of the Top Driver driving schools feel is important to teach future drivers. This entry was posted in Top Driver Blog and tagged Bad Driving Habits, Car Safety, Cell Phone Laws, Emergency Kit, Road - Side Emergency Kit, Road Safety, Safety Tips, Tips, Winter Driving.